Plot your best-selling story using Dabble's one-of-a-kind plotting tool called the Plot Grid. Using a Plot Grid is great a way to organize your ideas into a best-selling story line. Dabble’s Plot Grid is inspired by the method J.K. Rowling used to plot the Harry Potter series. 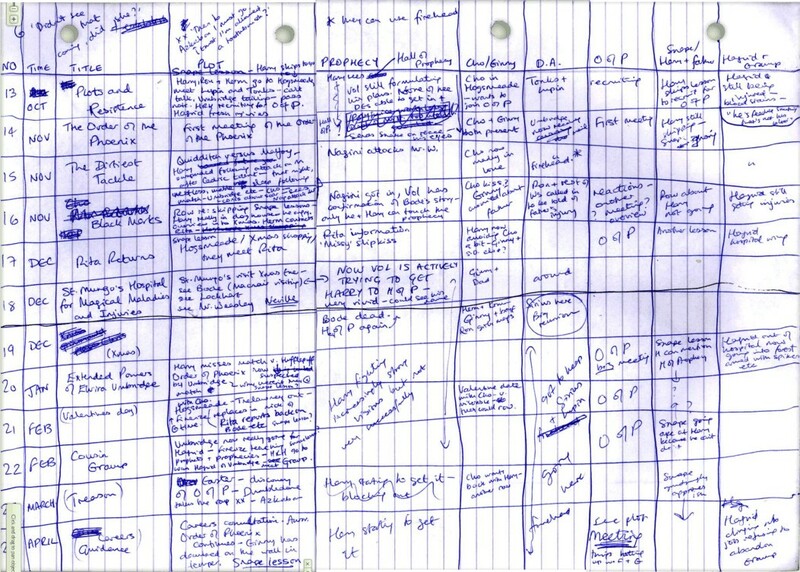 The Plot Grid is a unique tool integrated into Dabble, seamlessly entwining your Scenes and notes. Think outside the plot bubble method, the messy whiteboard strategy, and the time honored scribbled-on napkin method. Take a look at this simple Plot Grid for Jane Austen’s Pride and Prejudice. Plot Grids consist of columns (Plot Lines) and cards (Plot Points). The left-most column is a good place for Scenes or Chapters of your book. Plot Lines are Plots and Sub-Plots. Cinderella’s Relationship with the Prince is a Plot Line, just as Mice vs. Lucifer is a Plot Line. Plot Points are the finer details of Plot Lines. For the Mice vs, Lucifer Plot Line the Plot Points are: Lucifer takes nap by mouse hole, Mice sneak past for chicken feed, No mouse is eaten by Lucifer. Pro Tip: Think of each vertical column as a Sub-Plot, and the left-most column as a list of Scenes. The rows hold white cards with details and information about what happens in each Scene of your book. The left-most column is generally used for your main plot. Place your main Plot Points here chronologically. When read top-to-bottom, this column is a summary of your story. Create a Plot Point (white card) by hovering your mouse in the grid until a Plus (+) appears and clicking the plus. When the note card pops up, set a title and type any notes you’d like. New Plot Points also generate a new Plot Line (vertical column). Click on any Plot Point to open its note card to view and make changes. Click on any untitled element to name it. Pro Tip: Writing short titles keeps your Plot Grid easy to skim. If you decide a Plot Line is more important than another: reorder them by dragging-and-dropping in the left-hand nav menu. Add more rows by clicking the plus arrow icon (+ >) located in between existing Plot Points. The Plot Points are simple drag-and-drop, move them between Plot Lines at your leisure. Add as many as you want, in either direction. Hover over any Plot Element and the trash icon appears, this will delete them. Obviously! By the way, this is the left-hand nav menu. You can jump from your Plot Grid to an individual Plot Line or to your Manuscript or to an individual Chapter… jump, jump, jump. Want to make sure your character meets the scientist before he stumbles upon the murder he will later solve? Put the Laboratory scene before the Dark and Stormy Night scene in your first column! Want to keep track of your character’s various romantic entanglements so they’re neat and orderly? Make it a Plot Line! Want to illustrate that your character loves pizza? Or that the witch can only be killed with water? Make Plot Points! When creating your Plot Lines, you probably noticed Plot Points function like note cards. You’re smart like that! The Plot Point cards are perfect for diving into the finer details of your story. Plot Points hold all the details you could possibly want or need for your story - and everything that doesn’t fit in the Plot Point title. They’re also larger than the 10 lines you see here, hit enter for more lines once you reach the bottom. Cover tiny details, Scene changes, character descriptions, literally anything in Plot Points. Even sweet pieces of dialogue, or notes-to-self about why you’re writing this Scene. By highlighting text and right clicking, you can bold, italicize, or link text. Option 1: Click on a Plot Point from the Plot Grid: Plot Point pops up, you write clever details, click in the grayed out background to return to Grid. Option 2: Click on the Plot Line from the left-hand nav menu: See all the Plot Points in a row, add more, rearrange, return by clicking on your Plot Grid from the left-hand nav menu. Pro Tip: Speaking of typography, use shortcuts to your full advantage. Ctrl+B: Bold, Ctrl+Z: Undo, Ctrl+P: Paste. You live in the 21st century, you know the drill… they work everywhere in Dabble too! Oh by the way… Dabble has two Plot Grids systems. Gasp! We walked you through the Generic Plot Grid throughout this tutorial. But now it’s time to meet its evil, more powerful twin, the Manuscript Plot Grid. Generic: Adding Plot Points in the Generic Plot Grid doesn’t auto-populate anything in your manuscript. Manuscript: The left-most column becomes your Scene list, which you still treat as your main plot. Adding Scenes in the Manuscript Plot Grid adds them in your manuscript. Careful, because deleting them from within the Manuscript Plot Grid deletes them from the manuscript too. Oops you’ve accidentally clicked on a new Plot Grid, but which type is it? You’ll also see Scenes populating in the left-hand nav menu as you type them into your Manuscript Plot Grid (and you won’t if you’re typing in a Generic Plot Grid). If you followed our tutorial thus far, you know all about the Generic Plot Grid. This style has no effect on your manuscript. How very boring of it. Adding Scenes to your Plot Grid auto-populates them in your Manuscript. Remember - the left-most Plot Line in your Plot Grid populates your Scenes. So remember to use it for your main story line rather than a subplot. A Scene always populates in the same Chapter as the Scene above it in the Plot Grid. To add a new Chapter, click the Plus (+) button in the top right of the left-hand nav menu, North East of Manuscript. You can also see your new Scenes in the Manuscript Overview. Yay! Drag and drop Scenes as you please. But be aware, moving Scenes to a different manuscript order in the left-hand nav menu ALSO moves them around on your Plot Grid. Plot Points auto-populate the Scene Notes section in your Manuscript. In your Manuscript, the right-hand column contains the current Scene card and all the Plot Points from the Plot Grid in the same row as that Scene card. The cards you see in this image are from the first row of the Plot Grid, since we’re writing the first Scene. Clicking the next Scene or Chapter from the left-hand nav menu displays the next row of the Plot Grid. Caveat I: You can add notes to a manuscript without using a Plot Grid by typing them into the Scene cards in the right-hand nav when writing your Chapter. Caveat II: You can have one Manuscript Plot Grid for each book and as many Generic Plot Grids as you want. The possibilities abound! Multiple Plot Grids are perfect for plotting a series of books, or having a finished plot and a continuous work-in-progress plot, or a main plot and a sub-plot fully plotted out, etc. etc. etc! Pro Tip: If you decide on multiple Plot Grids for your book, only include one Manuscript Grid Plot style, to prevent mass hysteria and Chapter/Scene confusion. Feel free to share your Plot Grids on Dabble Writer’s community page to inspire fellow writers. Happy Plotting from the Dabble team!